Long-distance electric driving – how not to do it! As a rule I don’t think too much about charging the LEAF; I just plug it in at night and forget it. Once in a while, though, I like to try a longer journey than the daily routine allows; and last week one such opportunity arose in the form of the Formula E test days at Donington Park – 170 miles away. The journey up on Monday was pretty uneventful, apart from arriving at the Ecotricity charger at Watford Gap northbound to find it out of action. Fortunately I was able to sneak through to the southbound side, where the charger was working, and sneak back to continue my journey north. The return journey was a good deal more interesting, taking a full 12 hours – long enough to fly half way round the world! I know, you’re thinking ‘How could he be so inept?’ I’m still asking myself the same question. Leaving the circuit around 17.30 I charged up at Donington Services to 100%, and again at Northampton to 80%+. All was well with the world so, with nearly half a battery left, I sailed past Chieveley Services; reasoning that I could get to Winchester Services on the M3 or maybe even Rownhams on the M27. I like a challenge. It’s easy to overlook the effect of hills on an EV, and it slowly dawned on me that I might struggle even to reach Winchester. One should never forget, of course, that the LEAF’s sat nav indicates the distance to a charging point ‘as the crow flies’ until you select it as a firm destination. Rather too late I realised that Winchester Services, a mere six miles away, was fourteen miles away by road. Never mind, thought I, I’ll find a 13A charger for a ‘quick’ top-up. Consulting the Polar app on my iPhone, I found just such a charger at the Little Chef at Popham. Just about reachable. Indeed it would have been, had it not been necessary to leave the A303 then drop down under it before climbing back up a steep hill in the opposite direction. Before I reached the top of the hill the LEAF had gone into turtle mode, and cresting the summit I lost power altogether. Fortunately it was late in the evening, and traffic was light as I gently coasted the last half mile to the Little Chef. Turning in, I was relieved to find a slope down from the road. Looking frantically around for the Polar charging post, I spotted it on my left and very nearly managed to swing into the parking space. Nearly, but not quite. The LEAF is quite heavy to push uphill. Undaunted, however, I was able to get the car just within reach of the charging point. You may imagine my relief when I saw the first blue light flashing to indicate charging! Never mind that it took until two in the morning to add 15 miles of range, enough to get me to Winchester Services for the much-needed rapid charge. I set off with renewed determination, only to find the M3 closed without warning by roadworks. Aargh! On the roundabout over the motorway, it was time for another rethink. 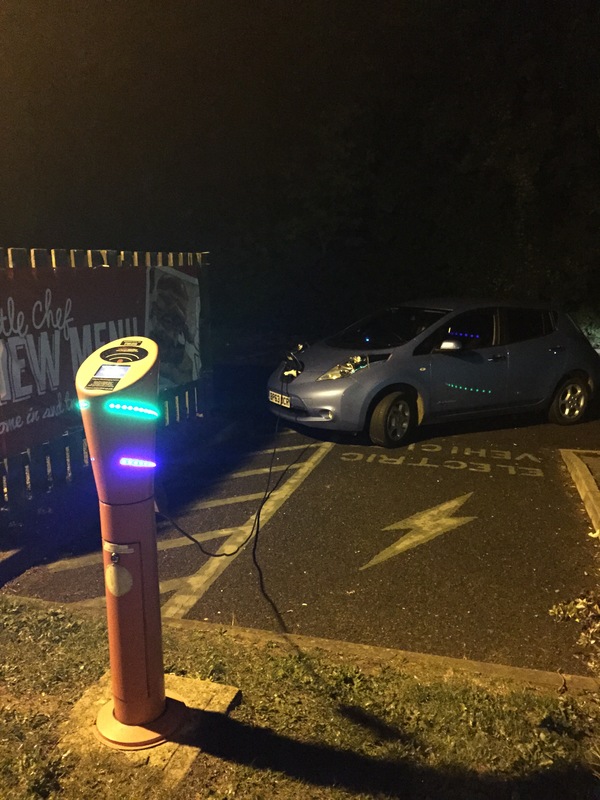 This time I located a CYC charger in the central car park in Basingstoke – an easy drive. Hurrah! Arriving in a dark and brooding Basingstoke, I quickly spied the charger and excitedly plugged in – only to find, of course, that it was out of action. It started to rain. So it was that I came to call the Nissan EV breakdown line. Within half an hour a flatbed truck arrived to take me, or so the driver thought, to Winchester Services. We loaded the car and set off. Once having established beyond reasonable doubt that Winchester was truly inaccessible, we headed in the other direction to Fleet Services. Here, at least, there are two Ecotricity chargers, so by 04.00 I had an 80% charge and all was well again. Dawn was breaking as I pulled into Rownhams services for a final precautionary top-up (now he gets all cautious!) and at 05.30 I arrived home, fully twelve hours after leaving Donington Park circuit. The moral of the story, of course, is not to look a gift horse (free charger …?) in the mouth. Alex Hansford’s experience, reported here on Speak EV, makes exactly the same point. ← What price a used LEAF? You are brave. Completely bonkers as well, but brave nonetheless !